A 20% reduction of the F1 grid has become poignant as well as damaging thanks to the collapse happening on the weekend of the United States Grand Prix. There was a time when the traditional October date represented exactly the opposite for what was then the last race of the season. Rather than being diminished, the entry was enhanced by teams entering third cars, thus giving the likes of Mario Andretti and Jody Scheckter their F1 debuts. The richest race on the calendar meant mega-dollars; always an attractive proposition in a sport that would spend every cent it had - and, frequently, did not have. That fundamental thumb-under-the-chin code remains exactly as it was. But what has changed is the need to find a budget that has gone into orbit. When the U.S. GP at Watkins Glen was at its peak forty to fifty years ago, Ferrari was the only team worthy of being described as well-heeled; Lotus, Tyrrell, BRM and McLaren could make ends meet; the likes of Surtees, Eagle, March and, in its latter days, Cooper, would struggle, much as Marussia, Caterham, Sauber and Lotus do now. But in the early 1970s, a measure of accumulating debt could be measured by Frank Williams having to borrow £50 from Bernie Ecclestone in order to buy enough diesel to get his one and only transporter home. That may be an extreme example, but it reflects a time when even the smallest outfit was not pressured into fulfilling standards set by leading teams with massive hospitality units and a fleet of trucks and personnel to service them. And that's before we discuss the race cars. In times so financially-constrained that even McLaren, with its experienced and professional marketing strategy, has difficulty raising the necessary $250 million budget, it is surely absurd that any team needs to spend $18.5 million on wind tunnel and CFD facilities and $20 million on salaries (to name but two eye-watering items on a recently released breakdown of costs for an 'average' team). Even allowing for the questionable catch-all excuse that it's impossible to uninvent technological progress, it surely can't be beyond the wit of man to draw up regulations that rid us of, for example, daft-looking nose wings that cost $30,000 to replace, never mind the untold hours and money spent creating a tweak the size of a credit card to produce an extra 0.001 points of downforce? According to the report, hybrid power systems cost a team $28 million. The contribution to greener solutions for road cars and the world at large is unquestionably worthwhile but, when costs reach such crazy heights, you have to ask if F1's priority is to act as a sport or a technical proving house? If we're looking for the middle ground, then cost control is essential - which is where the sport has failed abysmally. The head-in-the-sand attitude of the teams does them no credit. 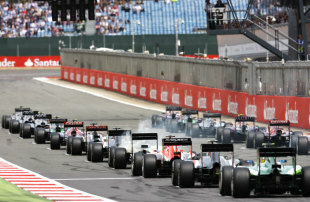 Jean Todt, president of the FIA, is powerless to bring about change in the face of the teams' collective intransigence. What hope is there for resolution of pressing financial issues when they couldn't even agree to increase the size of competition numbers? Of course, larger numbers would only benefit spectators who, despite F1's lip service to the contrary (and the good work of Oliver Weingarten's Fan Forums), are seen as irritating people who block the access roads and prevent teams from going about their business - i.e. making money for CVC Capital Partners. But let's not go down that avaricious road for fear of making this topic run until Bernie Ecclestone receives his next pay cheque. There's no denying that the rise and fall of teams has been part of F1's fabric since the championship was invented in 1950. Forty years ago Brabham, Hesketh, McLaren and Tyrrell finished in the top six at Watkins Glen: only McLaren remains in name. Ten years ago, BAR, Renault, Jaguar, Toyota, Jordan and Minardi were among the entries for the final race in Brazil. Even allowing for take-overs and repackaging, Marussia and Caterham could be described as no more than another unfortunate example of the sport's collateral damage. Three weeks ago in Sochi, team principals stood at the front of the grid to pay tribute to Jules Bianchi (despite the honest intention of the move, I'm still having difficulty coming to terms with the timing just before the start and a minute's silence that suggested the poor man was dead). On Sunday, the current pace setters would do well to gather at the opposite end of the grid and give thought to the hard-working and devastated Marussia and Caterham team members sitting at home and wishing they were in Austin. The F1 elite should also think about the many small businesses associated with these teams that are now crippled by outstanding payments. Then they should take a look at the four empty spaces and ponder who will be next. Maurice Hamilton writes for ESPN F1.